Today it is in the 40's so I am taking advantage of the great temps to boil my Thiox on my deck. What a stinky mess. I had to wear my big respirator. Just holding my breath didn't work (cough, cough). I weighed the fabric and it was under one pound. I put my lobster pot ( for art ) on my hot plate with 1.5 gallons of water and then added the Thiox, synthopol and soda ash. It foamed. As soon as the fabric touched the liquid, the color went. This is immediately after adding the fabric to the pot. Remember how red it was? Below is the fabric after an hour of boiling. As soon as the fabric touches air, the exposed areas turn blue. 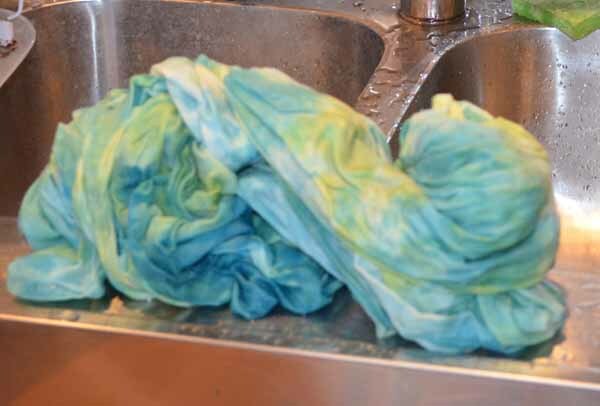 Below is the fabric drained (in my backyard) then rinsed in water. It is now in the washing machine. If you ever want to use Thiox even outside get a respirator - a serious respirator. Not a drop of fuchsia in sight. 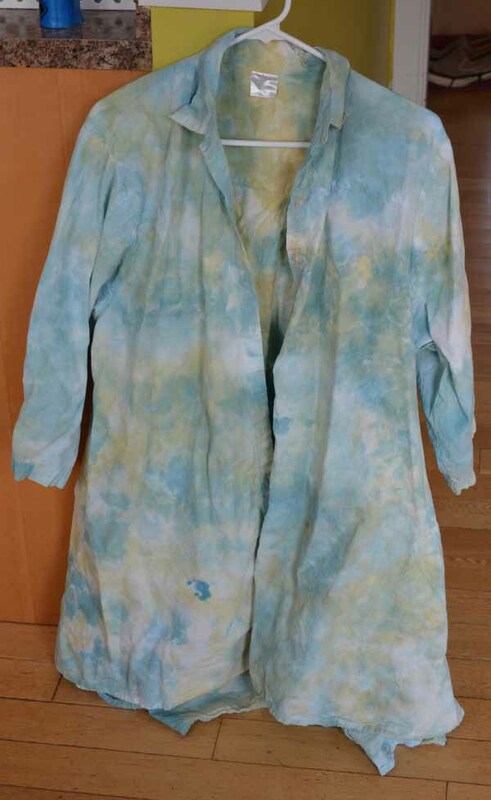 Next snow storm, I am mixing FRESH GRAPE dye along with green and turquoise. Tomorrow we are expecting 10 inches so stay tuned!! Looks lovely as is! Don't think I hate anything enough to try Thiox--that looks like some serious stuff! That's exactly how much I hate red. Thanks for the warning about the fumes... I have heard it is very stinky. I have used the kind you paint on and use the iron to remove the color, but that's for small areas. I'm glad you were able to remove the fucshia, and know it will come out better now... nice save! 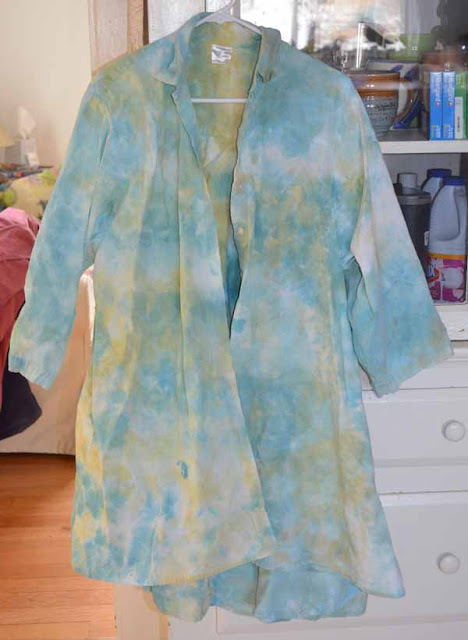 Lovely pastel shirt...Wow, that is quite a process, like a magic brew!